A new era of radical appliances and trends that give kitchens of today a foundational and aesthetic upgrade. 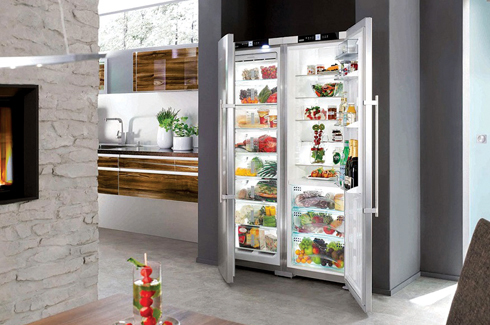 Liebherr freestanding fridge-freezers are outstanding appliances with many extremely useful features that help you to lead a healthy, modern lifestyle. The refrigerator compartment provides exceptional quality food storage, and if you’re looking to secure even longer lasting freshness, you can opt for the convenience of a BioFresh safe. Its NoFrost technology makes defrosting an unnecessary task. 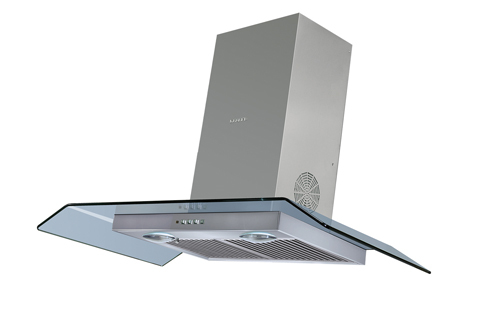 Faber introduces world’s first 3D Chimney with T2S2 technology with 3 way suction. Its unique filters on the sides of the hood extract any smoke that escapes the bottom vent. This technology ensures kitchen free from smoke & grease making it appear neat and hygienic just like the kitchen of your dreams. Available in black and SS options, 3D hoods come adapted to latest designs and finishes from Europe. It all began when groundwater researcher Narayana Peesapathy noticed his plastic spoon looking greasy and reused after he had his meal. 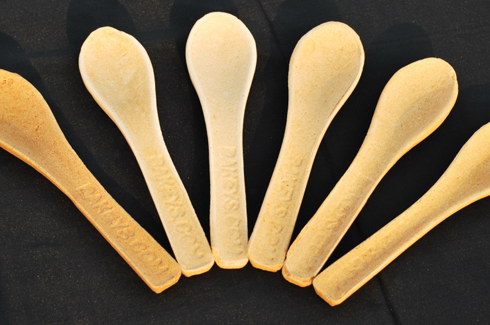 Although, this wasn’t the only reason he decided to make edible cutlery. His knowledge about the harmful chemicals plastic radiates into food compelled him to create this healthy alternative. This cutlery consists of forks, spoons, knives and even chopsticks, made of fried millet, rice and wheat. In a bid to also aid small businesses at the same time eradicating the use of plastic altogether, the researcher’s solution to this problem is as simple as it is brilliant! 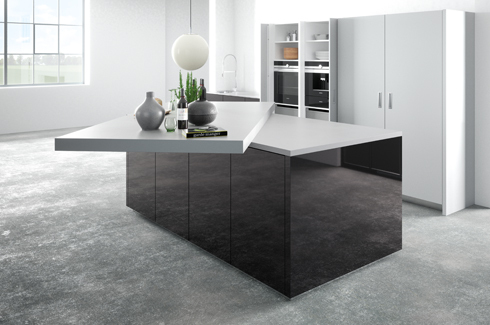 Hafele introduces its new ‘out-of-the-box’ range of Sliding Countertops that can double up as an addition to the current countertop or can cover built-in hobs, kitchen sinks, retractable faucets, pop-up sockets etc. when not in use – the possibilities are endless! This concept saves valuable space and transforms the kitchen into the social hub of the house enjoyed by the owners and their guests alike. This new pre-assembled corner solution comes with two versatile trays that can be extracted and retracted vertically by a linear drive, at the press of a button. Just one press on the integrated switch is all it takes for the Qanto trays to rise up. Reaching stored items in the kitchen has never been as easy. The new Planero basket from Vauth Sagel creates a new benchmark in design and functionality with its shelf-like look and slim clean cuts that allow maximum storage. 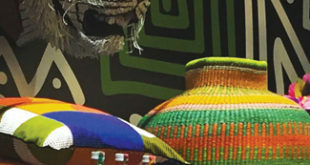 The Planero baskets can holistically meet the most discerning requirements of our customers with its ability to customize itself as per the required storage unit. 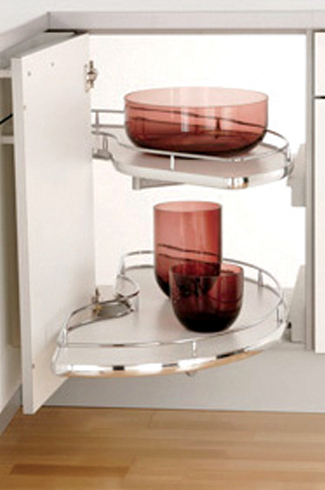 There are no visible mounting points, and the shelves can simply be removed for cleaning. 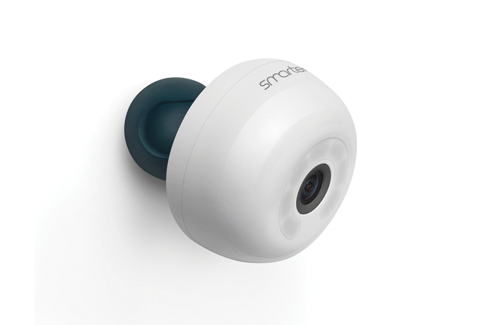 Another virtual assistant is Smarter’s suction-mount camera. The device sends photos from inside your fridge to your phone, so you know what you need when you’re at the supermarket. Smarter is also developing a sensor mat you can place in your refrigerator or cupboard to alert you when staples are running low. With FridgeCam in your home, you can minimize your food waste forever. Faber uses “Filmtec” membranes across the range which is made in U.S and untouched by human hands. The range offers assurance of 100% RO & UV water. 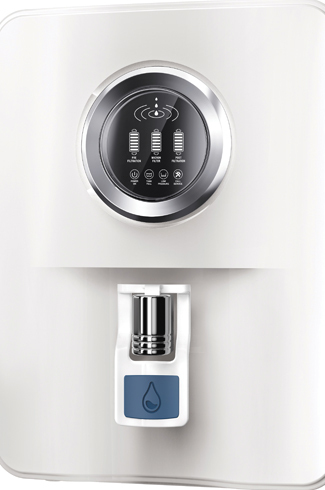 All the water purifiers offer “Germblock” technology which protects the purified stored water from microbial contamination. “Copper Guard” & “MAT” Mineral Addition Technology filter adds back essential minerals to purified RO water with copper acting as an anti-fouling agent. User can avail water whenever they need with 9Ltrs Storage capacity. Cooking is one of the strongest ceremonies of life and kitchens are an integral part of every home. But does it ever feel like you are stuck in limbo? The same ole appliances, tiles, platforms and storage units? 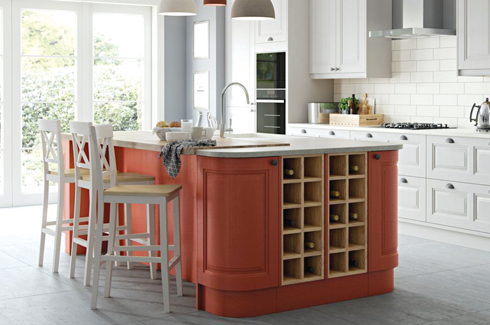 If you do, then good news is, 2018 has come up with some mind boggling yet simple design trends that will transform your kitchen into a multi-faceted haven! 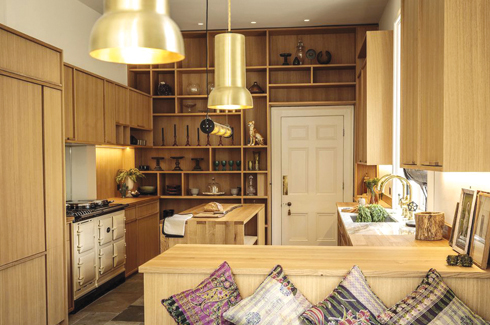 Gold has been on trend for a while now but the move to combining it with browns and organic materials is going to be big for 2018. Combining the use of neutrals, gold and organic textures, make for a warm environment with a slight seventies feel, hitting the mark in terms of both style and substance. The boho look is not only easily adaptable with other colours but also comes hand in hand with good quality and timeless design – something which a kitchen needs to present. 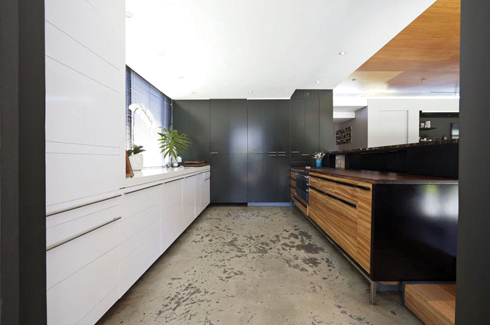 Layouts are usually dictated by the space available, but islands continue to dominate with many larger kitchens say the experts. Most islands have numerous uses with seating attached to incorporate dining. 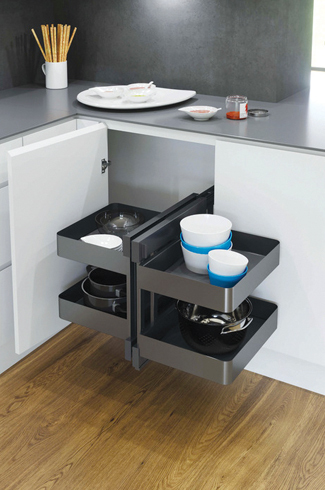 They can also have storage options along with in-built appliances like sinks or hobs. If the kitchen is going to face a revolution, why shouldn’t the appliances? One of the hottest trends we are seeing for 2018 is built-in gray-toned appliances in a dark brushed metal finish. Stainless steel appliances have dominated the market for quite some time, so seeing a different finish come into play is not surprising. 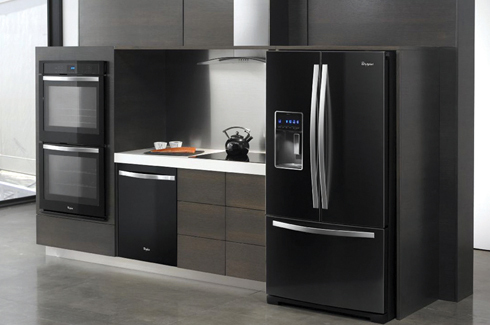 Built-in appliances include ovens, hobs and sinks in addition to fridges and storage cabinets. With their seamless aesthetics, space saving benefits and low maintenance traits, they are fast becoming a rage in Indian homes. We can’t avoid technology any longer. It has entered our workplaces, schools, bedrooms and now it is slowly slithering its way into our kitchens! Today, you can have a kitchen with technology integrated into every function and appliance–from the faucets to the fridge to the lighting and not just the gadgets and appliances. 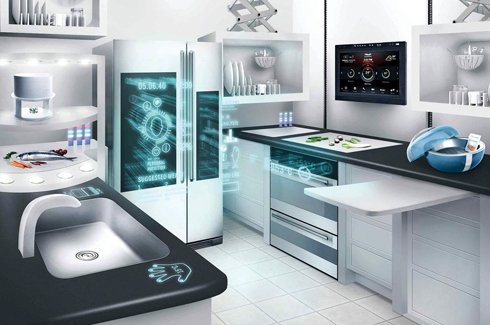 This is called a smart kitchen.Smart kitchens are an evolving aspect of design. In fact, a lot of kitchens today are built smart from the ground up. For older kitchens, sensors, smart gadgets and other devices can be added to for convenience to the homeowner. Easy add-ons are motion sense-equipped kitchen faucets that can sense the presence of hands underneath and will come on automatically. Refrigerators that can alert you when your groceries items are running low or a coffee maker programmed to have your coffee ready when you wake up. There is also a gadget that monitors your eggs, telling you which ones are almost going bad. 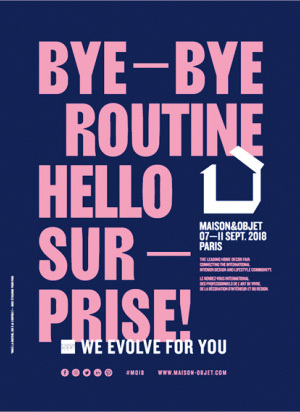 Do not forget to update your lighting system–allowing you to control all the lights from your smartphone or tablet.Technology integrated kitchens are becoming more popular as homeowners experiment with novel technologies. This is one of the biggest trends going into 2018. An inclusively designed kitchen is intended to offer independence to less able or wheelchair users, whilst at the same time being suitable for all other users in the household. With multigenerational living on the rise, the growing need to accommodate for different users, whether that’s ensuring enough space has been allocated to create a turning circle for a wheelchair, heights of work surfaces and workflow, has been noted as a key design requirement.Multi-user kitchens for those abled-bodied and less abled is an increasing wish for many homeowners with huge advances in moveable work surfaces, appliances and tables. 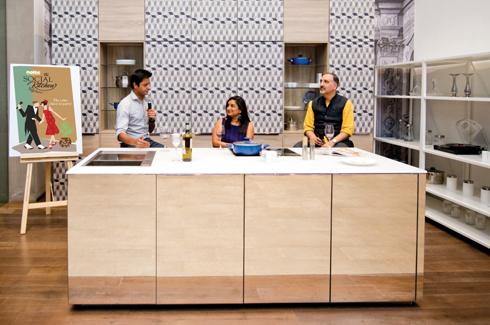 Space inside a house is one of the most dynamic ones; evolving constantly with the needs of the people.German brand Nolte which has been present in India for over a decade and has more than 20 stores across the country, recently launched a new trend called ‘The Social Kitchen’. The Social kitchen addresses the changing concept, look, feel and expectations from a kitchen. Over the years kitchens have come out from being a place where you cook food to where you spend time with your family, entertain guests and cook together with friends and family.